I love perfumes. I mean, I really love perfumes. I'm pretty sure I own more perfume than I could ever possibly wear but, of course, it's never enough! So when I was contacted by Debenhams to try out the One Direction perfume, I jumped at the chance. 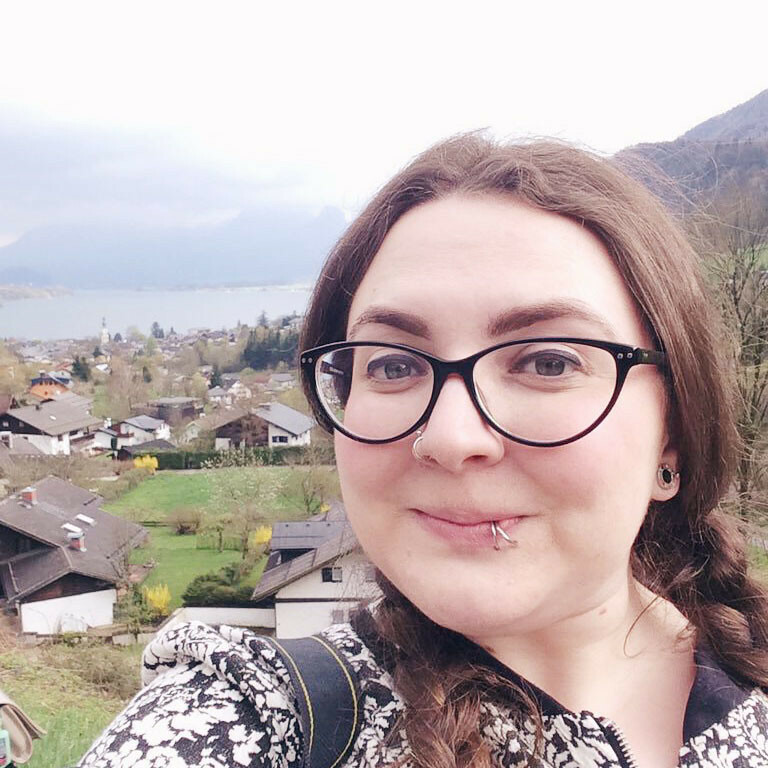 I know it might sound an odd perfume choice for me, but I was so impressed by the One Direction make up that I had to see if this lived up to my high expectations! 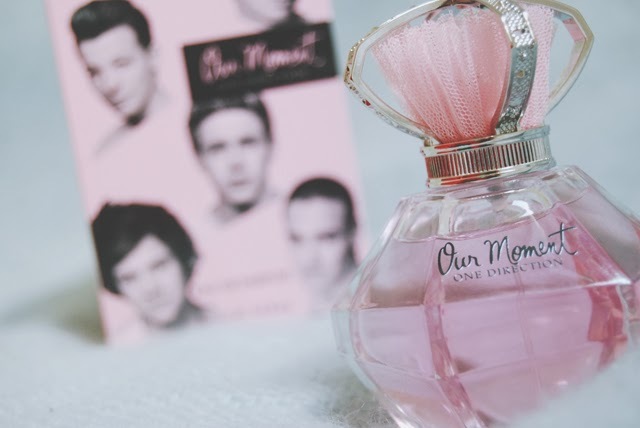 One Direction's One Moment Eau de Parfum is a fruity floral with notes of pink grapefruit, redcurrant and wild berries. On first spritz, the fruity tones are a little overwhelming but they quickly fade to the jasmine and patchouli midtones. After an hour or so, I noticed the woody musk base note. I found that the sillage is pretty much perfect- The scent doesn't sit too close to the skin but it's also not overpowering. This means that others around you will be able to detect your fragrance without choking to death. The scent lasts around two hours which might not be particularly long-lasting but it's no big deal to reapply as necessary. The fragrance is very sweet and playful so it is perfectly well-matched to the target market. Not exactly one for the sophisticated woman but ideal for young girls who want to express their youthful personality. In fact, it reminded me very much of Marc Jacobs' Oh! Lola perfume. 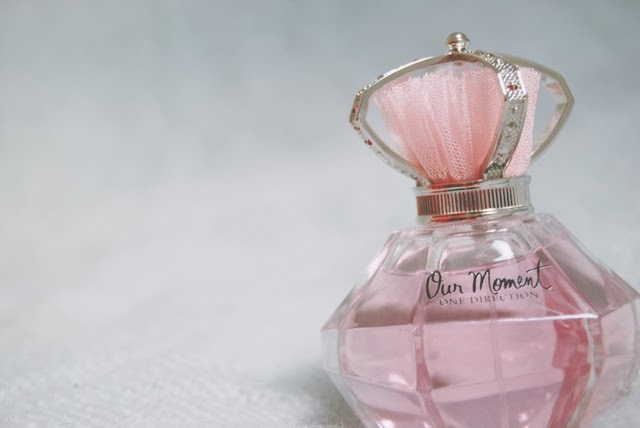 The packaging is extremely feminine with a crystal-shaped bottle and a lid fashioned on a crown with pink tulle detailing. Perfect for decorating a dressing table. Having said that, I recommend keeping perfumes inside their boxes as this protects them from light and keeps it from spoiling. The box is cute too, though, with pretty floral illustrations and adorned with the boys' faces. Let's face it- No One Direction fan is going to be put out by having Harry, Zayn and co staring up at them as they get ready! At £29 for 100ml, it's a little more pricey than other celebrity fragrances but it really is the perfect gift for One Direction fans. There's also matching shower gel and body lotion so you can buy the set. Much more exciting than just another poster! You should try it and see what you think! Oh God it reminded me of Marc Jacobs too, not sure they'll be too happy with the comparison tho! This defiantly isn't as bad as I thought it would be, plus it would be a pretty dressing table addition! Haha probably not- It's a lot more affordable than Marc Jacobs! Haha I see what you mean! Whoever's working on the One Direction-branded beauty is doing a pretty good job! They're called perfumiers :) I looked into it, actually but it's very science-based which isn't really my thing.